Many reptiles have different requirements when it comes to lighting. As this habitat is recommended for various reptile species, please use the table below as a guide to help you select the correct bulb. 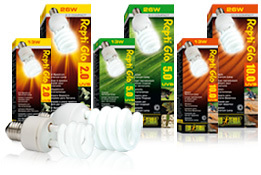 This bulb is suitable for snakes, all amphibians (frogs, toads and salamanders) and nocturnal animals. This bulb is suitable for all diurnal tropical species except snakes. This bulb is suitable for all diurnal desert species except snakes.